Another year for us is in the history books, and here are the fifteen bestselling garden rooms of 2017. Nearly half of the list is made up from our brand-new models, that where only launched last year. As a continuing trend we are seeing more and more larger cabins making the top seller list, as well as a strong and growing demand for thicker walls and double glazing in doors and windows. Garden buildings are increasingly being used all year round. We are seeing them being used as an extension to homes for hobbies or for ancillary accommodation. Some like to play snooker or table tennis in the comfort of their own garden, while others set up an office, living room, guest house or just an extra living space for the existing home. Our garden rooms are also widely used as garden fitness rooms, studios, yoga rooms, games rooms as well as garden kitchens and dining rooms. Thick walls, double glazing, insulation and light heating are must have cabin features for all year-round use. During 2017 we launched nearly 35 new garden rooms and currently we offer over 200 models to choose from. For 2018 we will launch a good number of new attractive cabins, with many of them being launched as early as January. In addition to new models we have upgraded many existing models to make them better, more durable and more user friendly. For example, all our 44-92mm log cabins come with metal storm braces that are inserted throughout the entire wall in four corners for significant extra strength. Most of these cabins now have German made turn and tilt window systems and extra thick 28mm floor boards as standard features. So, here are the top selling garden rooms of 2017! This top-seller is the perfect fit for small gardens. 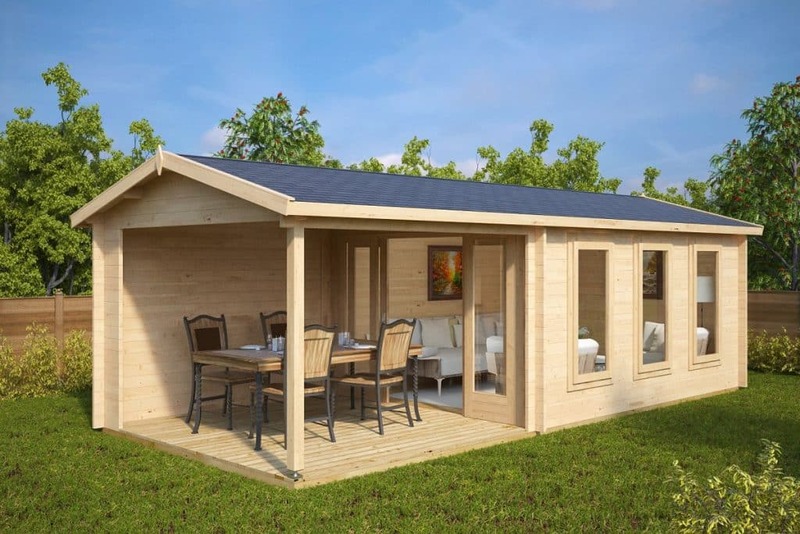 A garden room, spacious storage room and a veranda for sitting a hot tub or using for BBQs and garden dining are all in one very affordable log cabin. This cabin is our stock item, which means that delivery time is not more than two weeks from order! This elegant garden room could be a bright star of any garden party. Generous 4 x 3 m canopy for relaxing, dining, BBQs and for many other good uses and 10 m2 of space inside. Double glazed doors and windows are included in the standard price of this luxury garden log cabin. 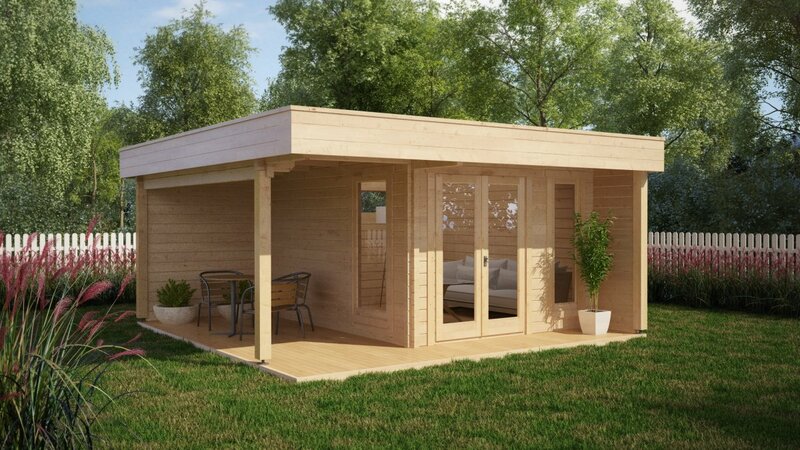 12 m2 garden room combined with 3 x 3 m veranda, which are conveniently connected with double glazed sliding doors. This garden log cabin could well be used as a garden fitness room and hot tub shelter combined or a combination of a garden bar and a BBQ shelter. 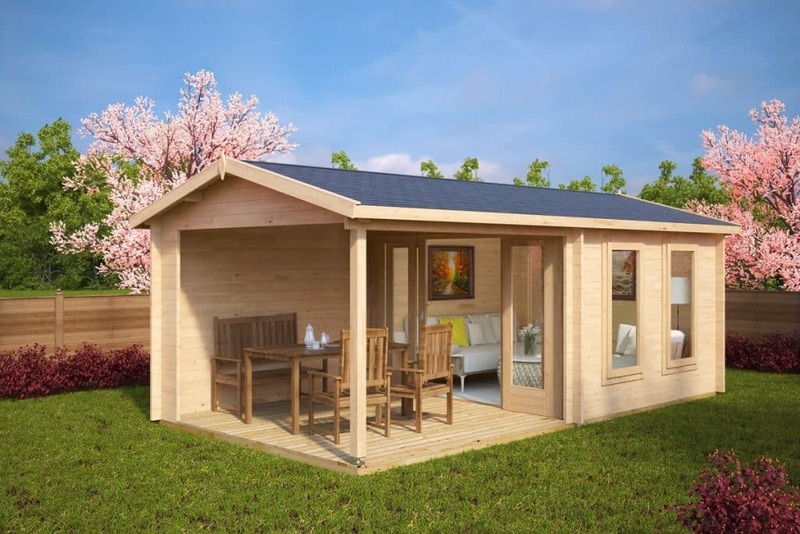 Whether you are looking for a garden office, studio or a hobby room with modern style and plenty of natural light, then the Hansa Lounge is definitely worth considering. Additionally, you will get good space for BBQs, lounge, hot tub or dining on its generous 2 x 5 m veranda. Popular garden room with over 20 m2 inner area. All four wall high windows are opening. This cabin with sturdy 44mm walls and double glazing with additional roof and floor insulation could be used all year round as a fitness room, studio or a garden office. 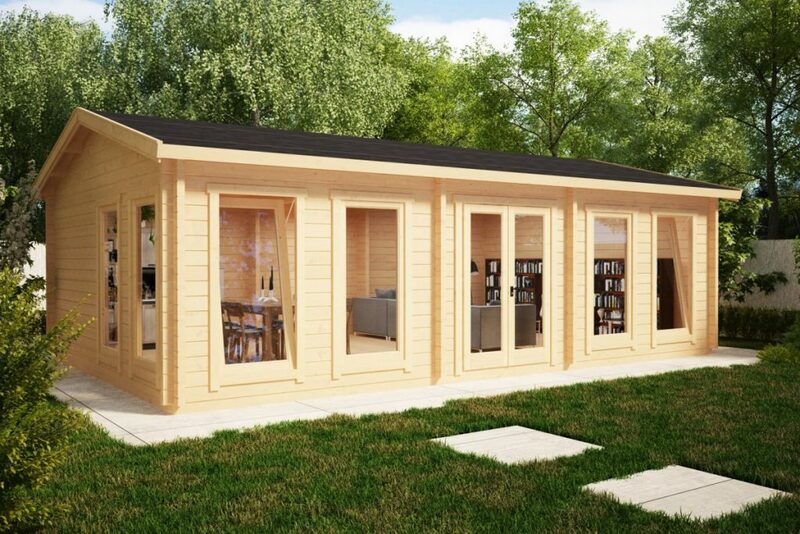 The Super Tom multifunctional garden building became an instant top seller from the day it was launched. 10m2 for garden living and another 5m2 to store all your garden equipment. Double glazed doors and windows, firm 44mm wall planks ensure good thermal resistance and long life span. 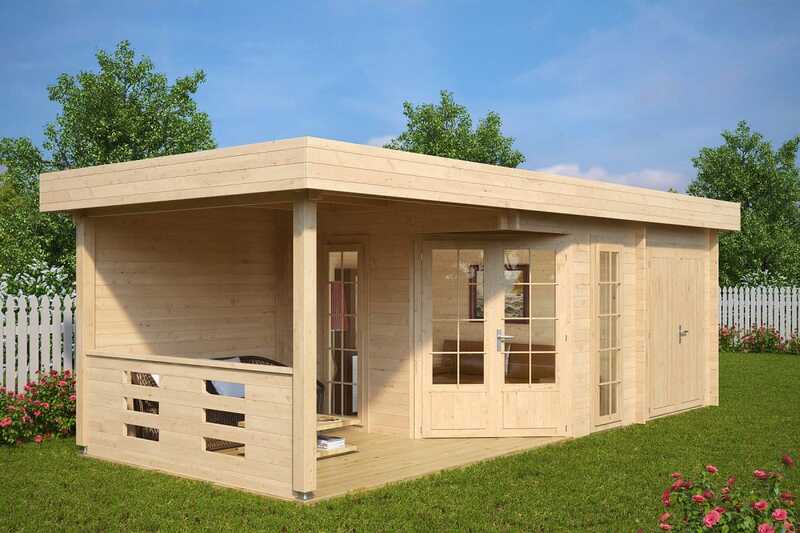 This extra large 38m2 garden log cabin was originally made for snooker fans but in reality, it is used for many different reasons that require lots of space. Massive 70mm wall logs and metal rods inserted throughout the entire wall ensure superb stability and decades long life span. 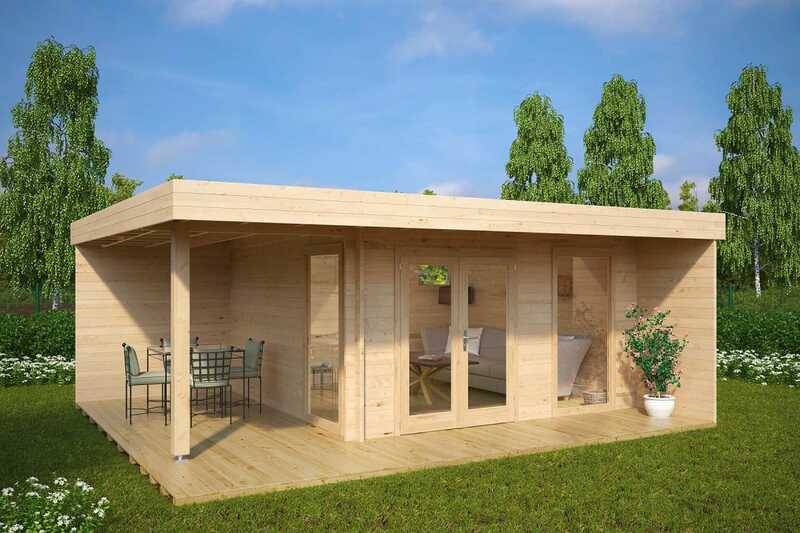 9 m2 garden room and 3 x 3 m veranda are combined in one affordable 6 x 3 m garden building. The room and veranda are conveniently connected with sliding doors, which do not require any space from the veranda to open and close. 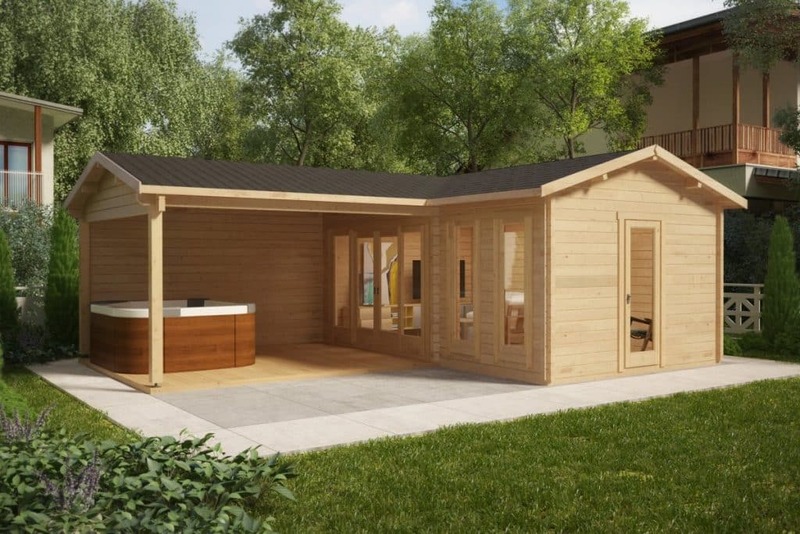 In other words, you can use the entire veranda and easily fit a 2,5 x 2,5 m hot tub. 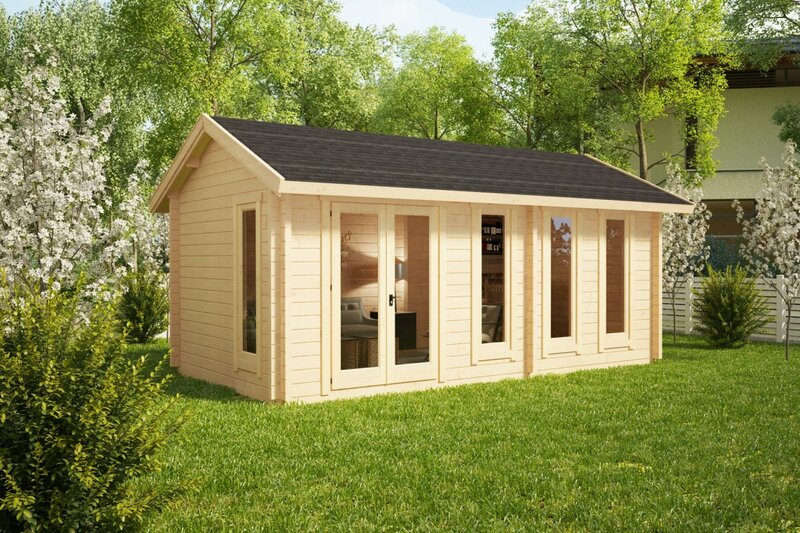 A very spacious 15m2 room, 4 x 2 m storage shed and generous veranda are all combined in one stylish 5 x 8 m garden building. 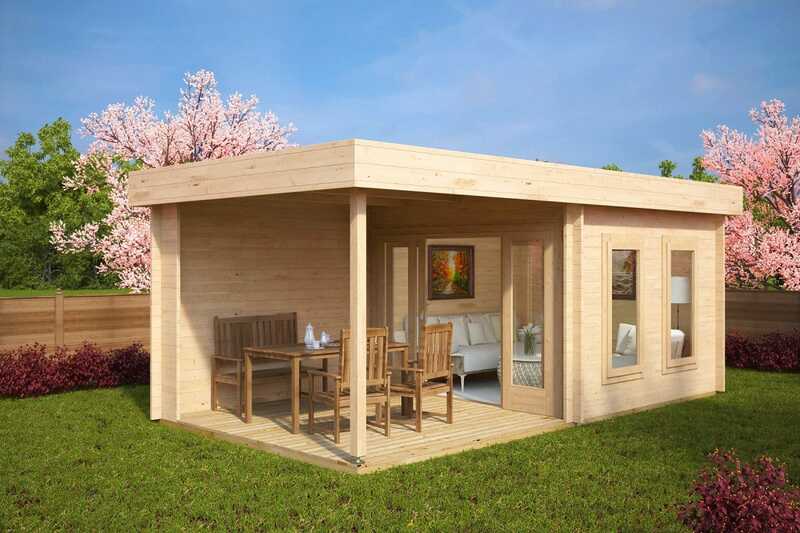 Double glazed windows and doors as well as metal storm braces and decent 44mm wall thickness are all standard features of this luxury garden log cabin. Great garden room to buy for upgrading your garden life to a brand-new level. It has 18 m2 inner space and extra large 4 x 4 m veranda. Double glazed doors and windows, extra thick 28 mm terrace boards, 44mm wall thickness and much more are all included in the standard price. 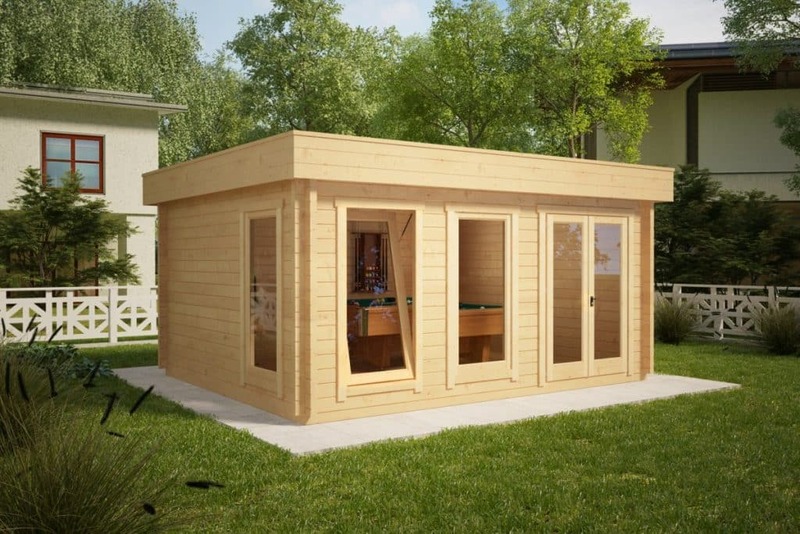 The Garden Room D is widely used for playing snooker, billiards or table tennis in peoples’ gardens, but can serve many other uses that require lots of space. 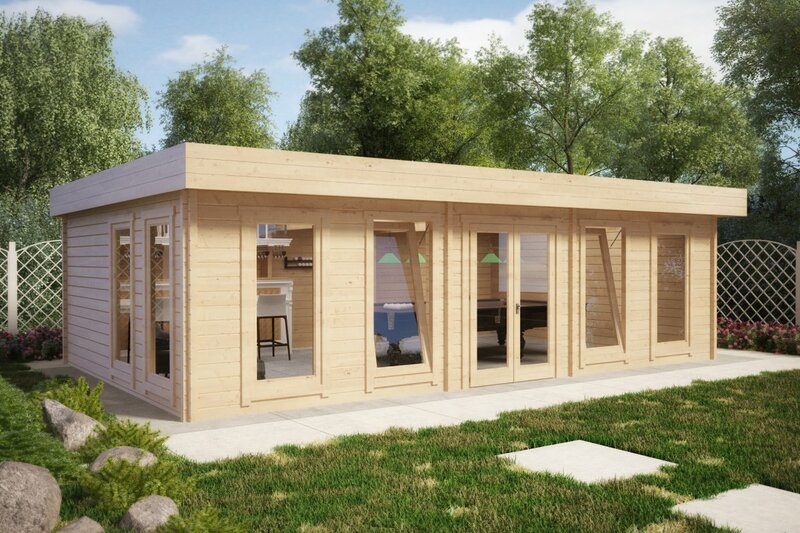 Nearly 40 m2 of inner area, massive 70mm walls, extra thick 28mm floor boards and double glazed opening windows and other superb features are all included in the cabin kit. The Ian D with its extra thick 58mm walls and double glazing can be used as all year-round garden office, extra living space, for playing pool as well as for many other purposes. Three wall high windows (all opening) and double doors let plenty of natural light in and open good views from the inside. 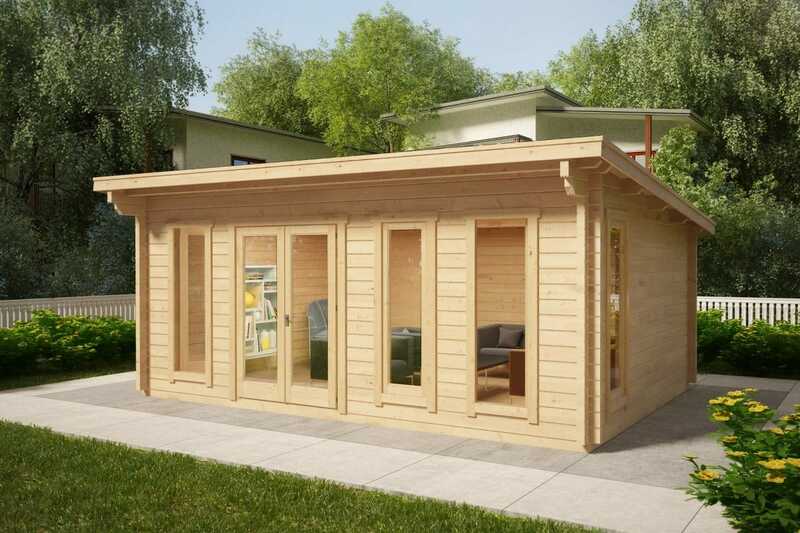 With the Hansa Lounge garden log cabin, you can set up the most stylish garden office or garden room in your town! 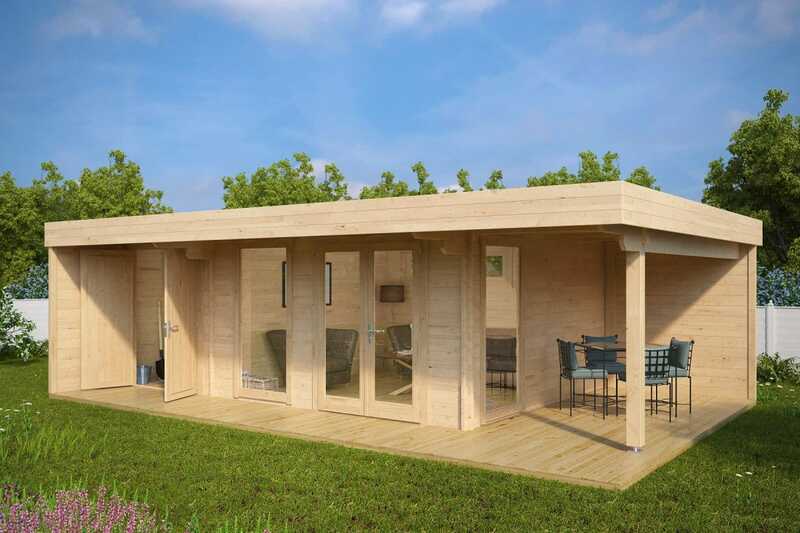 The large veranda can easily accommodate a dining area, lounge or a 2x2m hot tub. Standard cabin set includes 44mm wall planks, strengthening metal rods for inserting into walls as well as double glazed doors and windows. Roof and floor insulation together with light heating make it useable all year round. 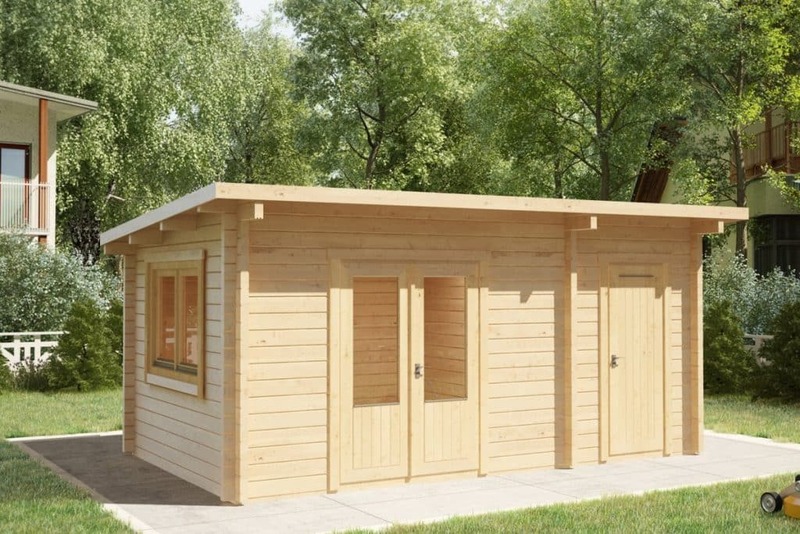 Popular medium sized garden log cabin with 16 m2 of inner space. All windows open. Standard cabin set includes sturdy 44mm wall planks, double glazing in doors and windows, strengthening metal storm braces inserted throughout the entire wall and many other great cabin features. 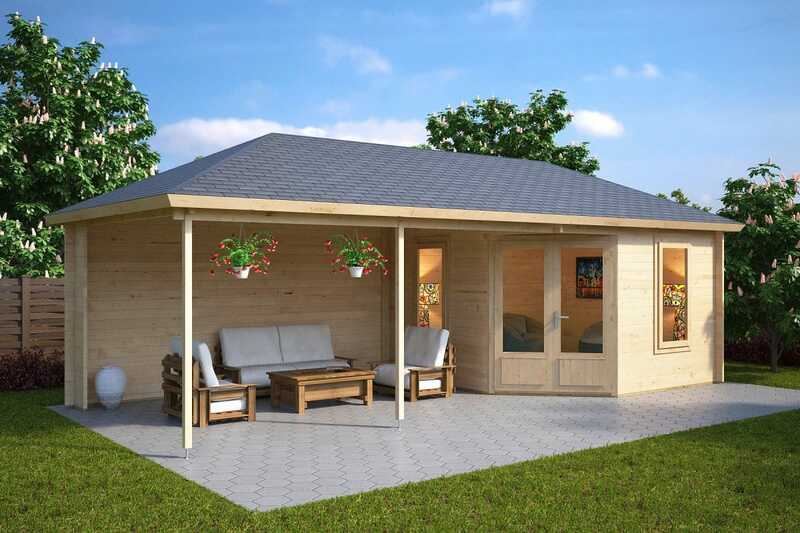 This garden room with large veranda is one of our most attractive garden buildings. The wooden terrace is protected with a canopy, providing shelter from rain or strong sun and one side of the terrace is closed with a wooden wall to make it more weather proof and give extra privacy. This garden room has been designed with sliding doors, which in our opinion, is the best way to seamlessly connect a room with veranda and keep them open during warm summer days.